AN ALL DAY DANCE PARTY IN THE HEART OF HIGHGATE AT SI PARADISO, SATURDAY NOVEMBER 17. 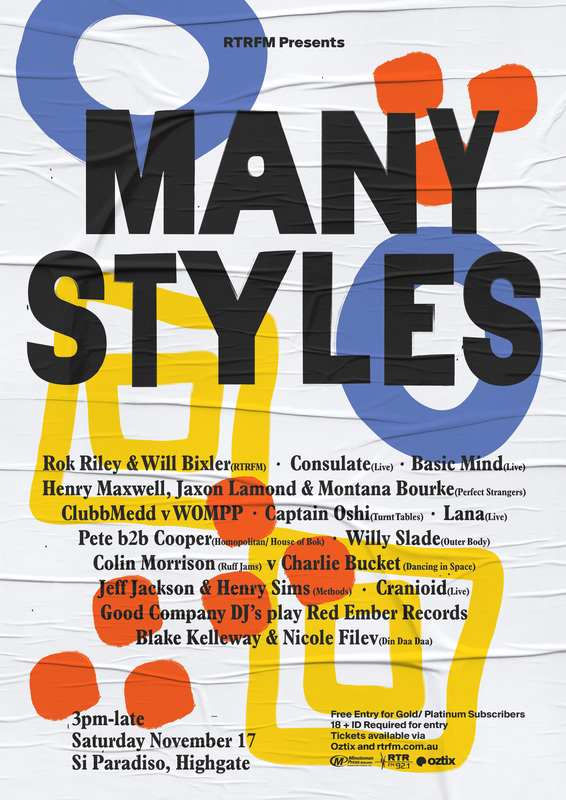 RTRFM has teamed up with the guys from Move and Good Company Records to put together a collection of DJs and party starters that will kick off the summer in the best possible way. Bringing together the best DJ crews in the city for one epic party, Many Styles will be just that many styles many styles. Outside in the Amplitheatre, hosted by the guys from House of Bok, catch the dance floor movers of Montana Burke, Henry Maxwell and Jaxon Lamond (Perfect Strangers), Blake Kelleway and Nicole Filev (Din Daa Daa), Charlie Bucket (Dancing in Space), Colin Morrison (Ruff Jams), Henry Sims and Jeff Jackson (Methods), Willy Slade (Outer Body), Captain Oshi (Turnt Tables), Cooper back to back Pete (Homopolitan / House of Bok), Good Company will play the music of Ewan Johnson from Red Ember Records. Plus the legendary Rok Riley going back to back with Will Bixler from RTRFM. In The Basement we go live with some of the finest producers in town, Consulate, Basic Mind, Cranoid and Lana. They will go deep and dark into the early morning. RTRFM is harking back to Seriously Sound System with a brand new event, come dance alll day and night with your home of Many Styles many styles.